You don’t have to put up with aging vision. Fix it now. With age, almost everyone will develop cataracts—a clouding of the lens of the eye that causes vision to become blurrier and darker over the years. You don’t have to wait for cataracts to “ripen,” as your grandparents did, before you can have them removed. Today’s cataract options allow you to take action early. What’s more, Dr Siepser can now address the other common problem of older lenses, the need for reading glasses, with a single, short, outpatient cataract procedure! Over time, the clear, flexible lens of the eye typically both hardens and becomes foggier, more opaque. This “cataract” makes things look blurrier, and usually darker and yellower or browner as well. Colors lose their vibrancy. It’s harder to read in dim light. The flexible natural lens is also connected to eye muscles that allow it to flatten or bulge to focus light from different distances. With age, the lens hardens and is less able to accommodate for various distances, causing presbyopia and the need for reading glasses. During ordinary cataract surgery, the replacement lenses are inserted into the space where the old lenses were, but aren’t attached to the muscles. Therefore, they can’t accommodate for different distances. What’s the best option for your eyes? 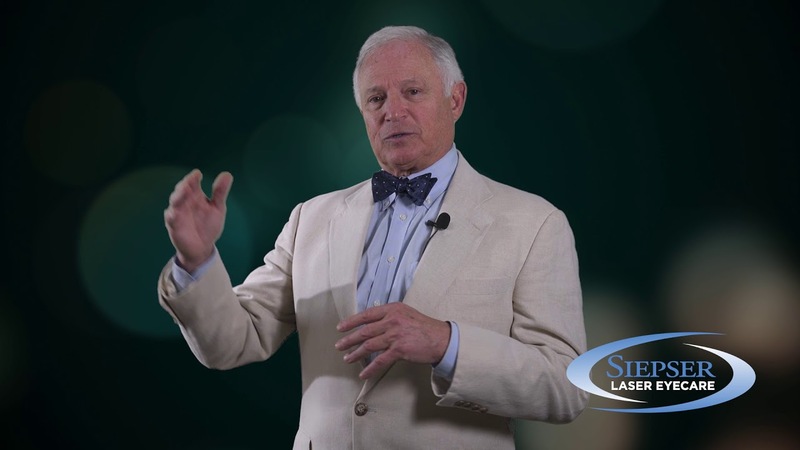 Review the options with Dr Siepser after your comprehensive exam. You’ll find out all about your eyes, and can discuss your vision goals to come up with the perfect plan for your vision correction. Dr. Siepser has performed more than 20,000 cataract surgeries over his career, making him one of the most experienced cataract surgeons anywhere. He offers multiple different solutions to help the widest range of patients obtain the best results. An accommodative lens is a replacement lens that attaches to the focusing muscles of the eye, so that you not only see clearly again at medium and far distances, but up close as well. Most people are able to do away with their reading glasses. Dr. Siepser attaches tiny hinges to the eye’s focusing muscles so that your eye is able to once again change the shape of the lens to focus at different distances. Dependence on reading glasses is dramatically reduced or even eliminated, along with the cataract and blurry vision it can cause. This is another option that extends the range of focusing with a cataract procedure. This high-tech lens has different areas of focus, sort of like an internal bifocal. It is inserted in the eye in replacement of the old, cataractous lens. If you have glaucoma, a condition that affects the nerve that sends signals from the eye to the brain, Dr. Siepser offers procedures that can treat the problem and eliminate the need for a lifetime of drops. Depending on your individual challenges, he will choose from several different types of procedures. Glaucoma, which is an increased pressure in the fluid of the eye that gradually causes vision loss, has been treated for decades by use of daily drops. Not only is this a hard regimen to follow closely—it’s not a permanent or complete solution. A quick outpatient procedure actually reduces your risk of vision loss as well as freeing you from multiple applications of daily eye drops. “Floaters” are those little shadows that seem to dance across your vision. Painless, and generally harmless, they can be annoying nonetheless. If you are troubled by floaters, Dr. Siepser can remove these for you.